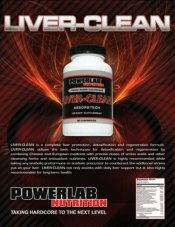 POWERLAB NUTRITION's POST CYCLE is the latest technology in post anabolic cycling. 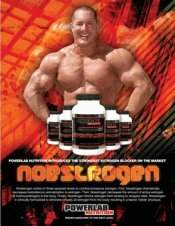 POST CYCLE should be taken immediately following any pro-hormone, pro-steroid or any anabolic cycle. 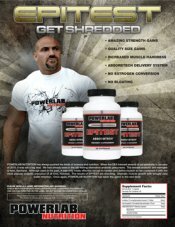 POWERLAB NUTRITION's POST CYCLE will raise testosterone levels and deliver incredible muscle pumps. 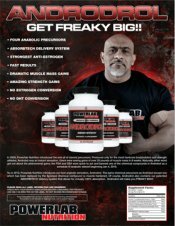 The proven ingredients will increase mental focus and strength during training. 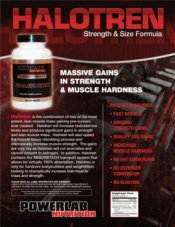 Post-anabolic lag (strength and weight loss) is completely eliminated while muscle growth and strength gains continue similar to during anabolic cycle. 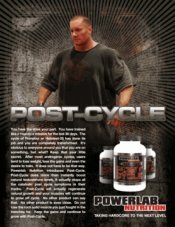 POWERLAB NUTRITION POST CYCLE is formulated with 100% pure pharmaceutical grade ingredients. Suggested Use:As an adult dietary supplement, take 6 capsules 30 minutes prior to training. Drink plenty of water.